There are a small number of Christian books about self injury, mainly personal accounts, and I have been trying to collect them for some time. These books listed are ones I own – but I will be adding more shortly. Links on the book title take you to Amazon UK where, if you buy the book, I will receive a small sum. “Secret Scars: One Woman’s Story of Overcoming Self-Harm” Abigail Robson (Milton Keynes: Authentic Media, 2007) This personal account traces her journey from self harm and an eating disorder to recovery through the power of God’s love. Robson now runs Adullam Ministries and teaches about self harm. “Crying Scarlet Tears: My Journey Through Self-Harm” Sophie Scott (Oxford: Lion Hudson Plc, 2008) Another account of the journey from self harm to recovery. “Self Harm: The Path to Recovery” Kate Middleton & Sara Garvie (Oxford: Lion Hudson Plc, 2008) This is not a specifically Christian book but an overview of self injury from a Christian author and available in Christian bookshops. “Blade Silver: Color Me Scarred” Melody Carson (Colorado Springs: NavPress, 2005) Fiction book intended for the teenage market. “The Cutting Edge: Clinging to God in the Face of Self Harm” Jess Wilson (Milton Keynes: Authentic Media, 2008) I have reviewed this book here. “Cutting: A Healing Response” Jeremy Lelek (New Jersey: Association of Biblical Counselors, 2012) A short pamphlet giving advice for counsellors about self injury, using the example of a young woman called Justine. Biblically grounded, this booklet talks about grace, the gospel, and how to deal with sin in the lives of self injurers. I would definitely recommend this, particularly as it is short and to the point. Also available on the Kindle. “The Parent’s Guide to Self-Harm: What Parents Need to Know” Jane Smith (Oxford: Lion Hudson Plc, 2012) Not specifically Christian-orientated, this book is by a Christian author and published by a Christian company, and is specifically written for the parents of people who self injure. “Cutting Edge: Witnessing Rites of Passage in a Therapeutic Community” Elizabeth Baxter in “Controversies in Body Theology” Marcella Althaus-Reid & Lisa Isherwood, eds (London: SCM Press, 2008) Contextual theology viewing self injurers as “Christa”, as a type of Christ. The whole book is interesting, though the rest of it is not directly associated with self harm. 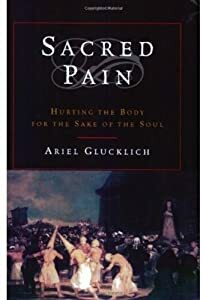 “Sacred Pain: Hurting the Body for the Sake of the Soul” Ariel Glucklich (New York: Oxford University Press, 2001) the different types of self injury practised by religious people historically and in the present day.